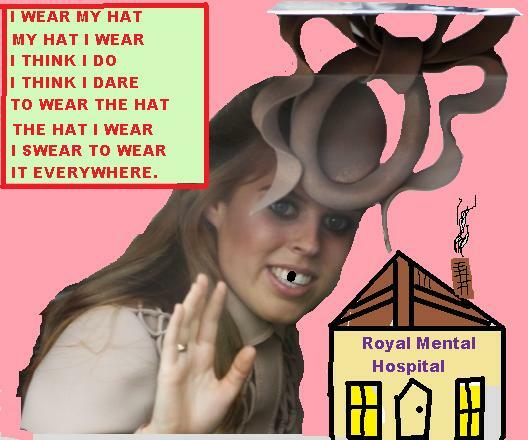 Home → Damien Zone → Princess Beatrice Ugly Hat Lands Her In The Mental Hospital. “We had to haul them off as soon as the Royal Wedding festivities moved from the streets,” said Lord Freddie Young-Pith about Princess Beatrice and the hat she wore to the wedding ceremony at Westminster Abbey. Burton was not available for comment but a spokesman for Burton Enterprises said that he was watching the Royal Wedding and he recognised the hat Beatrice wore as one that was reported missing from the warehouse several weeks ago. Police opted not to arrest Princess Beatrice opting instead to have her put into a mental hospital. Princess Beatrice is the daughter of Prince Andrew and Sarah “Fergie” Ferguson, and it has been known for the past few years that she is trying to demean the great fashion sense of the Royals by wearing things that would eventually land her either in jail or the nuthouse. Sources say that she wants to be Queen so bad that she has lost control over her urges. Last summer she tried to kill all the people who are ahead of her in line for the throne. “At a family get-together last summer, the Royals were playing water-polo in a lake at Balmoral Castle,” said Lord Freddie Young-Pith. TheDamienZone can see that Princess Beatrice has crazy eyes and horse teeth and for this reason she should be made the Queen of something — perhaps Zimbabwe or something. This is the Best Laugh Ever. Thanks so much, Ya’all. Mucho thanks, Shadowcat — I try so hard to amuse yet horrify yet tittilate, yet degrade — hehe – thanks for coming to TheDamienZone.com — and tell your friends. Put the Beatrice thing up on your Facebook or something — I am not a tempermental artiste !